Name of societies founded in many German cities since about 1890 for the spread of the study of Jewish history and literature. 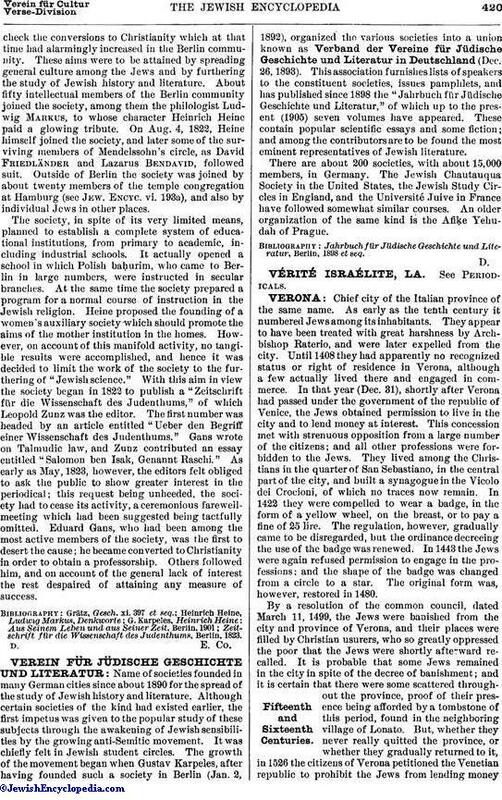 Although certain societies of the kind had existed earlier, the first impetus was given to the popular study of these subjects through the awakening of Jewish sensibilities by the growing anti-Semitic movement. It was chiefly felt in Jewish student circles. The growth of the movement began when Gustav Karpeles, after having founded such a society in Berlin (Jan. 2, 1892), organized the various societies into a union known as Verband der Vereine für Jüdische Geschichte und Literatur in Deutschland (Dec. 26, 1893). This association furnishes lists of speakers to the constituent societies, issues pamphlets, and has published since 1898 the "Jahrbuch für Jüdische Geschichte und Literatur," of which up to the present (1905) seven volumes have appeared. These contain popular scientific essays and some fiction; and among the contributors are to be found the most eminent representatives of Jewish literature. There are about 200 societies, with about 15,000 members, in Germany. The Jewish Chautauqua Society in the United States, the Jewish Study Circles in England, and the Université Juive in France have followed somewhat similar courses. An older organization of the same kind is the Afiḳe Yehudah of Prague. Jahrbuch für Jüdische Geschichte und Literatur, Berlin, 1898 et seq.